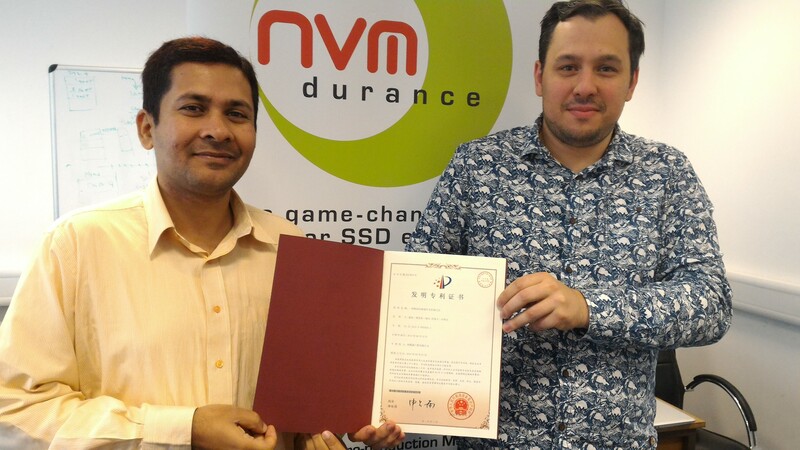 NVMdurance, formed in 2013, was first granted a patent in 2015. This Chinese patent makes it the fourth patent granted. Two have been granted in USA (US Pat No 8,984,210 and US Pat No 9,262.319) and one in Ireland (S85799). NVMdurance software implements a set of NAND flash optimization techniques that constantly monitors the health of the NAND flash and autonomically adjusts the operating parameters in real time. The patent covers the two parts of NVMdurance software – Navigator and Pathfinder. Before the memory product (e.g. an SSD) goes into production, NVMdurance Pathfinder determines multiple sets of viable flash register values, using a custom-built suite of machine-learning techniques. Then on the controller of the end-product, NVMdurance Navigator chooses which of these predetermined sets to use for each stage of life to ensure that the flash lasts as long as possible. The company is actively targeting the Asia-Pacific region and recently participated in a commercial roadshow in China and Taiwan with business partner Altera (now part of Intel). During the roadshow, NVMdurance demonstrated an SSD reference design using Altera FPGA technology powered by NVMdurance. The solution was presented to many of the region’s major flash memory users during the week of 18th July 2016. Today, the global NAND flash market is growing at a CAGR of 10.1% to 2019, with market revenue expected to top US$49 billion by 2019. The SSD market is expected to reach $229 billion by 2022.